I’ve been sorting through things I had in storage and one such treasure is a 1977 Marvel Comic that tried its darnedest not to look like a Marvel Comic. The other year, a commentator on i09 told me that Neil Tennant (before the Pet Shop Boys and Smash Hits) had harboured a desire to launch a British-style war comic. What came next was Captain Britain, but that’s a different story. I’m not sure how much control Tennant had over the content of the titles he shepherded, but a run of Sergeant Fury and The Howling Commandos reprints started in The Mighty World of Marvel #220 in 1976. Apparently readers had demanded it (I’ve just seen this issue on Amazon for $130 which boggles the mind). So the Lee-Kirby war series sat alongside the Hulk, Luke Cage and Daredevil for the next few weeks. It was kind of fun to see those initial issues of the Howlers adventures reprinted. Although the Marvel UK range had stuck to superheroes, fantasy and horror in those days, testing the ground for a war comic made a certain sense. Such things were big business in the UK comic scene and Marvel was a relatively small player. For Fleetway and DC Thomson, comics such as Battle Picture Weekly and Warlord were big sellers, alongside assorted digest titles such as Commando. It might have seemed a little old fashioned but Victor held its ground, Action was ruffling feathers, and the likes of Hotspur and Tiger were going strong. Mind you, I was a bit of a Marvel Zombie then and my interest in these titles drifted. (Rebellion have recently revived the Battle brand for a number of projects). Was this Dave Gibbons first work for Marvel? Anyway, come March 1977, I popped into our local Forbouys on a Wednesday morning to find Fury #1 on the counter. I don’t recall any promotion before hand. It came out cold and had the gift of a little plastic aircraft to entice readers. These would become common and unimaginative covermounts for Marvel. Might still have mine somewhere. Readers were treated to another model plane in issue two and issue three came with a terribly upmarket poster reproducing an oil painting from the Imperial War Museum (which I can’t find at present). Content wise, the comic presented the Lee-Kirby Sgt Fury and The Howling Commandos, odd short stories from Fifties Atlas titles and Captain Savage and His Leatherneck Raiders. There were some features, contests, a commando club (join for 30p, get a wallet and decoder ring). But they skipped the glossy cover, removed the credits and made a half-arsed attempt to emulate the look of their rivals. The Marvel name was kept to the small print. I believe the first issue cover is the first artwork that Dave Gibbons produced for Marvel. Can anyone confirm or deny? It didn’t really fly. The Sixties/Fifties reprints were competing against titles that were trying to shale up a genre that despite its popularity was increasingly being viewed as old fashioned. Charlie’s War it wasn’t. Where they did score was the covers. After the opening salvo from Gibbons, Marvel hired Carlos Ezquerra to provide artwork that had a bit more fizz than the inside pages. His art was a regular feature of Battle and he had also recently started drawing something called Judge Dredd. Ultimately, snazzy covers alone do not make a comic popular. Fury lasted until issue 25. The final issue came out in August 1977 and united the Howlers and Leatherneck Raiders in a single story (The Peacemonger, a reprint of Sgt Fury #64). The final issue had an accidental symbolism by using a diving submarine on the cover. They were still recruiting for the Commando Club though. The ad on the left appeared in Fury, the ad on the right in MWOM. Being comics, the story wasn’t over. A special ad informed readers that Sgt Fury and the Howlers were heading back to the pages of The Mighty World of Marvel. A similar ad in MWOM seemed a bit more dynamic. The move hastened the end of Tomb of Dracula reprints until MWOM underwent a more drastic metamorphosis into Marvel Comic as part of the Marvel Revolution. In the meantime, despite the return of the Howlers, the Hulk resumed his coverstar status on MWOM. The logo would soon be amended to read Sgt, Fury. Inside, the Hulk, Fury, Captain Marvel , Daredevil line up persisted until a merger with The Complete Fantastic Four (don’t ask!). 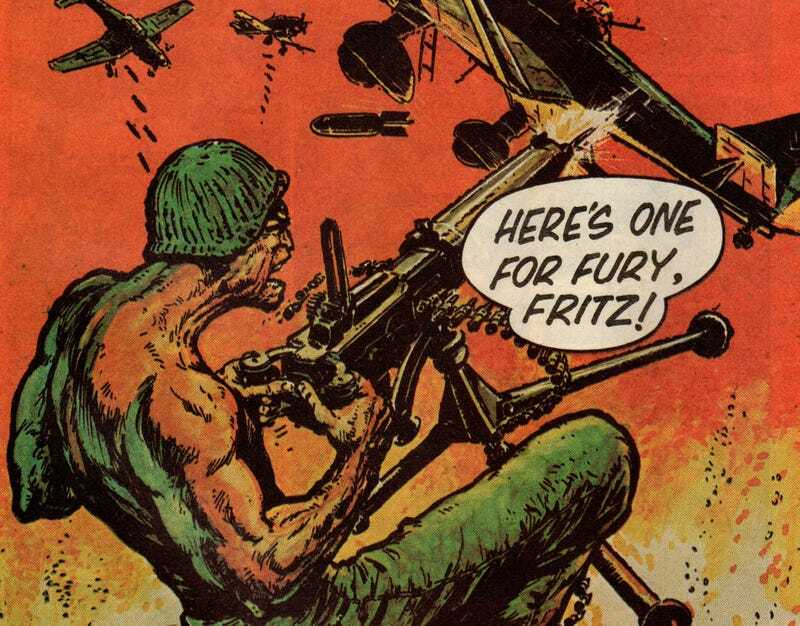 Fury would make a return to Marvel UK a few years later in the Paul Neary edited Forces in Combat (1980). It was an attempt to emulate the traditional British adventure comic. Apart from the Howlers it sported Shang-Chi, Kull, Machine Man, Rom. War is Hell, Rawhide Kid and a total outsider, Ron Embleton’s Wulf the Briton. That lasted 37 issues before being merged with Future Tense. Wonder if my set will surface?